Bee swarm removal becomes necessary when bee swarms form. When a hive becomes too large and the worker bees can no longer communicate with the queen, they will instinctively feed egg cells with royal jelly and new queens are hatched. When the queen cells hatch, the dominant queen takes over half of the existing hive. 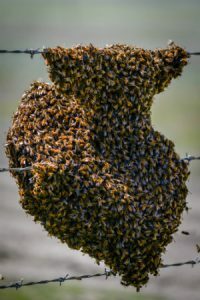 Swarming is the action of one of the queens leaving the existing hive with half of the colony, consisting of anywhere from 1,000 bees to 10-20,000 or more bees. So, basically, a swarm is a colony of bees on their way to a new destination to set up housekeeping so they can continue their species. On their way to the new destination (click here to see where bees like to build their hives), the queen and the colony will stop at a tree, a bush, on a building, or on a fence, etc. When a swarm is arriving or leaving, it is an intimidating sight! It is a very large, black, noisy cloud with bees flying everywhere. They will eventually land and become calm and docile. A visible ball of bees in an unprotected area is almost always a true swarm and consists only of bees – no hive! While the swarm is resting in the tree, bush, etc., the bees are generally docile and stay in their “ball” or “beard-like” formation. If someone throws something at them, sprays them, or tries to hose them down, they will fly everywhere until they settle back down in the same area. If left alone, this swarm of bees will fly off in 1-3 days. For bee safety tips, click here. A swarm is a solid clump of bees without any hive or honeycomb. Swarms are in transition, meaning they are on their way from one destination to another. Swarms are very docile as they have no honeycomb to defend; they just hang there waiting for instructions. Do not spray or disturb them or they may sting. If someone throws something at them, sprays them, or tries to hose them down, they will fly everywhere until they settle back down in the same area. If they’re left alone, the swarm will fly off in 1-3 days. After three days, there’s a chance they may NOT leave and start building an exposed honeycomb. If they do adapt and begin building honeycomb, they become territorial and will defend their new home. The Bee Man removes and relocates swarms every day and is happy to take care of your swarm removal needs.